My camera broke at the crucial moment. 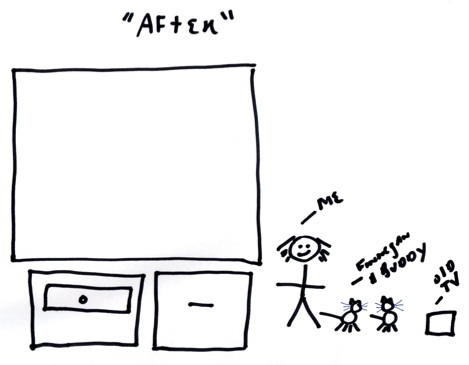 Until I fix it, here’s my artist’s rendering. Even though I had the measurements, somehow I didn’t understand how big this TV is. It overwhelms my Lilliputian apartment. But I don’t care. I love my new TV. I have no plans to leave the house at present. I love this drawing, it’s beautiful.